"Closing background apps when you're not using them makes your battery drain faster" Is that true? Basically, a truly-backgrounded ("suspended") app uses no power but can be restarted instantly, while starting an app from scratch is not instant, and anything that takes time also takes power. Where the disconnect comes, I think, is knowing whether that application you're not actively using is really and truly suspended, or whether it's secretly phoning home and draining your battery. an app that does not behave well when backgrounded (or anytime, really) shouldn't be closed, but deleted. there's generally enough competition to find a better replacement. well, at least up to 18,552 m, assuming we are limited to piloted prop-planes. I have to wonder why motivation for correcting people in situations like this can't be out of actual benevolence. For example, as a photographer, I cringe at the legions of parents photographing their kids' school concerts with their phones upright. They're using about 1/3 of the available frame area, and have therefore 1/3 of the effective resolution in use (not to mention simply horrid photos containing mostly audience member heads and the gymnasium wall). Don't get me wrong... I'm angry about plenty of other stuff. It's just that that's not my only motivator. For everyone wondering if this is really true: Based on a Google search it neither helps nor hurts to close background apps. Technically it hurts slightly due to the time it takes to close and reopen them, but that's just a technicality. Which makes flying a plane to tell people it that much more silly. There are uncommon exceptions including background GPS, downloading and music. Also if you have background refresh on, but mine is off by default. So... closing them helps maybe rarely, but probably not. Given that 99.9% of the public doesn't understand the difference between closing a document and exiting/quitting the application, quashing this rumor about background apps is likely to be impossible. Oh my gosh. The <marquee> banner literally made me laugh out loud. So embarrassing. 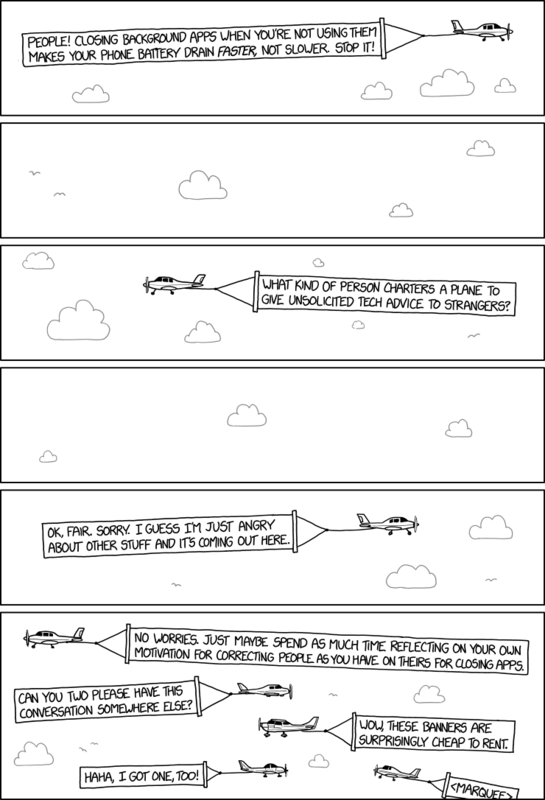 fibonacci wrote: It was all fun and games until the aerial banner SQL injections began. Now you can drop planes from the sky! The issue is that a lot if apps do behave badly in the background, but at least Android O is cracking down on them. ericgrau wrote: There are uncommon exceptions including background GPS, downloading and music. Also if you have background refresh on, but mine is off by default. So... closing them helps maybe rarely, but probably not. Maybe GPS is uncommon for you... It seems to me that most store apps allow you to use GPS, so you don't have to spend the time telling it which store you are at. The aisle/shelf location database is per store. It also helps for those that have relatively accurate stock levels. Some of my other apps use GPS for tagging things. I also like some poorly written games. I briefly thought that one of the games was mining Bitcoin, but I realized that Bitcoin miners would rather not be producing crashes so often. It was probably infinite loops. My GPSs (across all tablets) are almost always off. The GPS being on (whether or not I knowingly have an app making use of it) drains the batteries like buggery. Whether or not I have an App listening to it, foregrounded or backgrounded. The only (single, identifiable, not system-indifferentiatable) thing that uses more is the Wifi. I turn it on when I specifically want to use it. An occasional track. The odd time I need to get a point position recorded (and have five minutes to let the cold-start settle down). Every now and then a local geohashing run (for my own entertainment only) when I make sure I bring at least two USB powerpacks to replenish my charge during, and then afterwards when the first pack gives up its own ghost and I usually have called it a day. I don't even run Wifi (or mobile data) at the same time as my GPS (stockmarket downloads happen for the Geohash, whenever, I check the spot, then I'm offline by the time I activate the tracking - I don't even use the Wiki-upload repirter as I'm not Wikifying my trips at all), and deny the option of the Location Services prompt every time the GPS is switched on (yes, I know it could help the cold start get up to speed quicker, but combined power/data/privacy concerns make me happier taking the time penalty as the digest assembles from the constellation itself), something which seems to lack an "refuse by default" option. * GPS Test. A simpler "what spot is this?" operation, also handy for 'holding' the warm satellite fix. But has no practical map at all, even in principle. Sometimesmore than enough for what I need, though. If anything else is using the devices' NMEA/whatever data-streams then it's not something I've asked for. Google's front page, in my browser, sometimes estimates my location (either from the hotspot/masts I'm connected to or from analytics on my queries) but seems to default to a postcode that's about two zones over from where I might normally be using it. I'm happy with its imprecision, and if I query store-stocks I'm probably doing so (manually) for branches in one or another nearby town, not one I'm standing in, or could be within minutes, and able to check in person. Call me a technoluddite, but I'm not one to broadcast explicit location information to the world, atop of all the passive service-level stuff that I can't really do much about. speising wrote: an app that does not behave well when backgrounded (or anytime, really) shouldn't be closed, but deleted. there's generally enough competition to find a better replacement. That's like saying "Don't get a virus scanner, simply avoid the shady parts of the web" in response to security related questions. Both answers might be technically true, but aren't really helpful in a majority of cases and for a majority of users. I would actually like a television program called "You're wrong". In this program the presenter would explain why a commonly held belief was wrong. That would be all it was. Correcting people. That said, I had to force-quit Google Maps today. Useful for getting me out of the city, not useful while it eats my battery on a two hour drive. zjxs wrote: I would actually like a television program called "You're wrong". I suspect you'd enjoy the "General Ignorance" portion of QI, http://www.imdb.com/title/tt0380136/?ref_=nv_sr_1. Stephen Fry hosted for several seasons, and now the Sandi Toksvig. The general goal of the show is to gain "points" for responding to prompts in a way that's either correct, or barring that at least interesting. Points are docked for responses that are some combination of wrong and predictable. And keeping to that theme, point corrections are issued when the judges of the show were wrong as well. The "General Ignorance" portion in particular is about things of the "oh, everyone knows that", and typically goes into one or more explanations of how the belief is likely to have begun, and what evidence suggests actually happened regardless of the popular narrative. - Even mainstream apps (hangouts, youtube, etc) can sometimes exhibit minor bugs that closing and reopening clears up, or prevents. - I spend 95.2% of my time in a small handful of apps, and like to switch through them with the open apps list, so closing infrequently used ones reduces clutter and annoyance. What about those background apps you havn't opened since the last reboot loading into memory? Surely the effort alone of the phone loading them uses power? If I spend the weekend driving around and using the map app on my phone, then reboot it on a Sunday night, and don't use it Monday to Friday, surely it is sucking my battery by background loading? You could get a couple good seasons just out of the "List of common misconceptions" Wikipedia article. Still, I'd be a skeptic of such a show til I saw who ran it. All those clickbait articles that say "you're doing X wrong" range from mildly useful to galactically stupid. Add in an app that allows you to force AGPS updates and most of the cold-start waiting goes away (assuming you have data, not always the case in backcountry GPS, for instance). richP wrote: Add in an app that allows you to force AGPS updates and most of the cold-start waiting goes away (assuming you have data, not always the case in backcountry GPS, for instance). My old TomTom used to download (when plugged into the computer) a quick start to get a GPS lock. Probably a look up table with some of the heavy calculations done for it in advance. Only downside is I'd have to pay for map updates where new satnavs and my phone update their maps for free. Ephemeris data? Probably secondary to roadmap updates, but could cut the 12½ minute maximum (barring coverage gaps) waiting time for the full constellation down to just the four-minute-grab detail (maybe within a minute or two, half the time, depending on your luck), that's possible without having to discover major changes to the almanac through broadcast alone. Combined with a form of smart-start (self-contained GPS receiver gets priority on powering up the device, already assembling the information needed before the display-part can do anything with the NMEA data it needs to supply) it can seem seamless. The more dedicated and basic the device is, though, you're more aware of how much preparation is being out into the fix, and less likely to put a delay down to the 'outer packaging' system needing time to ask you which address you're aiming for, etc, which can usefully overlay the current ignorance of the device with your fumbling efforts to tap in the half-remembered Postcode/ZIP, or try to find the scrap of paper you wrote it on. But I'm not an expert at the mass-consumer product end. I've mostly played with dongles and hats, and had to work with the (almost) raw stream flowing out of the receiver-board. It gives insights, but is far short of soldering my own chipsets together and working at firmware level or writing my own (other-)user-friendly interface atop the whole package. The ones that tend to use up your battery in the background also have a distressing tendency to do so whether or not you try to shut them down. The FB app and Kindle have both been banished from my phone for their non-stop CPU-hogging and incessant battery draining. xtifr wrote: It is a source of constant amazement to me that an app designed to show moving pictures and sound across the internet (Netflix) can be so much better behaved on a mobile device than an app designed to show static text (Kindle). You might want to look into their data usage. Just saying. Avoiding admitting its ignorance is one benefit, but the main benefit is that it lets the app do both sets of waiting in parallel rather than waiting for one thing, then starting a separate waiting process for another thing (either waiting for user input before starting the GPS fix, or waiting for the GPS fix before requesting user input). Bellerophon wrote: The issue is that a lot if apps do behave badly in the background, but at least Android O is cracking down on them. I imagine that's because Facebook's background process is constantly spying on everything you do. xtifr wrote: The ones that tend to use up your battery in the background also have a distressing tendency to do so whether or not you try to shut them down. The FB app and Kindle have both been banished from my phone for their non-stop CPU-hogging and incessant battery draining. Amazon also has their own mobile platform (FireOS), so they have an incentive to make their apps on other OSes utter garbage in order to convince you to switch. See also iTunes for Windows since literally always. Steve the Pocket wrote: Amazon also has their own mobile platform (FireOS), so they have an incentive to make their apps on other OSes utter garbage in order to convince you to switch. See also iTunes for Windows since literally always. Except that's, like, utter nonsense. It's saying, "here, have a free taste of our restaurant's food from this food truck! Yes, it's utter crap, but what we really want is for you to come in to our restaurant and pay us good money to eat our food. We promise, the food in the restaurant is much better than what we're serving on the food truck."